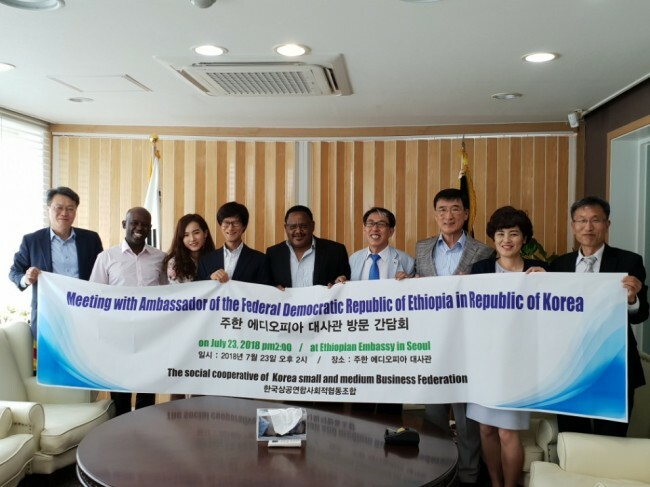 The Social Cooperative of Korean Small and Medium Business Federation visited the Ethiopian Embassy on Monday to discuss ways to promote and vitalize commercial exchanges between Ethiopia and Korea. The organization is the first cooperative authorized by the Ministry of Strategy and Finance to give a boost to small and medium-sized enterprises and create more jobs. It focuses on original equipment manufacturing businesses for its over 250 corporate members, many of them with technological competitiveness in their fields. Ethiopian Ambassador Shiferaw Jarso briefed the cooperative about Ethiopia’s economic policy for development, including government incentives for foreign investments and technology transfer, as well as the business environment for manufacturing. Ethiopia -- a vast country in the Horn of Africa region with a booming economy -- offers very cheap labor costs, strong manpower and a large consumer base of 110 million people, plentiful land and water, and a prime geographical location for tapping into markets in Africa, the Middle East, Asia and Europe, he highlighted. The cooperative’s Chairman Kim Young-ki explained the institution’s main business to the envoy and spoke of his aspiration to attract more members with cutting-edge technologies. Kim also said that he would introduce Ethiopia’s favorable business environment to the members to reap the benefits of the rapidly developing Ethiopian market. The cooperative plans to organize a business delegation to Ethiopia in September. The meeting was organized by business consul Rhee Gong-hwan, the chief executive officer of Sspouts International Co. Ltd, who was appointed by Jarso to strengthen bilateral business ties.